Made with fiber-rich rolled oats, heart-healthy sliced almonds, and naturally sweet dried cranberries, these bars will help fill you up and please your taste buds. Looking for a low-calorie treat that will satisfy both your hunger and your sweet tooth? Well, look no further! These Low-Calorie Oatmeal Cranberry Almond Bars are the best of both worlds. 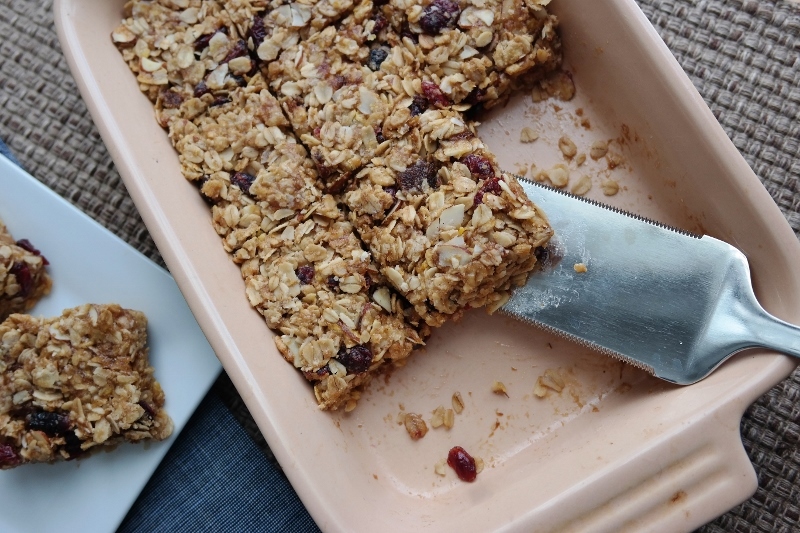 Made with fiber-rich rolled oats, heart-healthy sliced almonds, and naturally sweet dried cranberries, these bars will help fill you up and please your taste buds. They're perfect as a quick breakfast paired with a protein smoothie or as an afternoon snack along with a warm mug of tea. Each serving has just 225 calories. 1. Preheat oven to 350° F. Spray 8-inch square baking pan with non-stick cooking spray. 3. Spread batter in prepared baking pan, use the back of a spatula to press down batter. Bake for approximately 30 minutes until bars are cooked all the way through and lightly browned on top. 4. Let bars cool completely in pan before cutting.